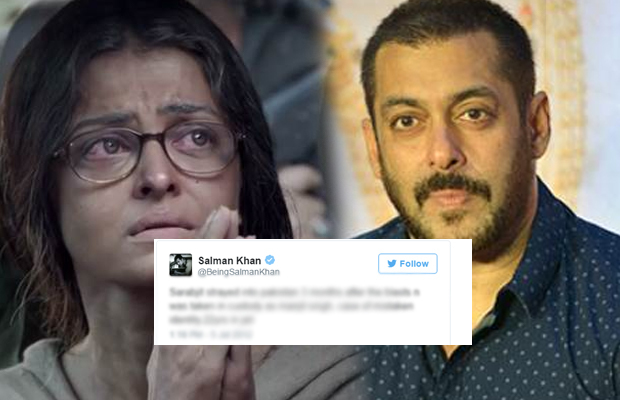 Home BOLLYWOOD When Salman Khan Tweeted About Aishwarya Rai Bachchan’s Sarbjit Singh! When Salman Khan Tweeted About Aishwarya Rai Bachchan’s Sarbjit Singh! [tps_footer]Bollywood actress Aishwarya Rai Bachchan starrer Sarbjit trailer is finally out and it’s surely gut wrenching. Filmmaker Omung Kumar impressed one and all with his debut film ‘Mary Kom‘ and his new film, yet another biopic that has currently left everyone stunned with its powerful storyline. Featuring Aishwarya Rai in a de-glam avatar, the biopic film is the story of a Punjabi farmer Sarbjit Singh (played by Randeep Hooda) who mistakenly crossed the border and was imprisoned and eventually killed in a jail in Pakistan. Sarbjit is a very strong and emotional film that takes us on the struggling journey of a sister who fights for her brother’s justice after he gets arrested by Pakistani rangers. Helmed by Omung Kumar, the film is a biopic based on Sarbjit Singh, which showcases a real-life struggle of an Indian prisoner who died after a brutal attack in Pakistan jail in 2013. Well, the real story of Sarbjit had left many people shocked in India and they did their every bit to pass on the message that he is an Indian. In 2012, even Salman Khan had taken to his twitter to share the message on the same, which has been retweeted by actor Randeep Hooda today after the trailer release.